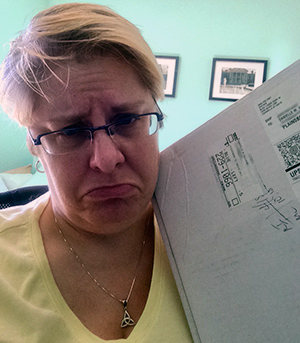 Here I am with my Google Glass package, sad that the experience wasn’t more, and the price was significantly less. As disappointed as I was that I’d have to return my Google Glass because it really wasn’t in the budget, I knew there was a 30-day trial to use Glass, so my husband suggested that perhaps I should give the trial a whirl, and if I still liked it, I could purchase it again later when the price goes down. I wasn’t keen on the idea because I was afraid that if I liked the product enough, I’d be reluctant to return it. Despite his encouragement to try Glass first, my husband didn’t help the cause, as he’d constantly be emailing me negative articles about Glass. Nonetheless, I decided that I’d forge ahead and give Glass a try. I didn’t even last one morning. Upon receipt of my Google Glass, the Glass didn’t have enough charge to even set up my account on the device out of the box, so I had to charge it overnight. Even with an overnight charge, it was only at 88%. Something’s not right with that. You’d think that with such a small device that a) there would be just enough charge in it to set it up, at least, and b) that charging it overnight would put it at 100%. So, not a good start, but by the next morning, 88% was enough power to be able to set the device up. Now, I hate to compare apples to oranges, but I couldn’t help but make mental notes of how much the experience was nothing like dealing with an Apple mobile device. Yes, I know that Glass is not a smartphone, but it does connect to one’s smartphone, after all. I’ve done the set-up of my son’s Android smartphone (and I will admit, I’m no Android expert) and set-up 4 iPhones and 2 iPads over the years, so I think I have a good idea of what a good out-of-the box experience should be. I’m also fairly adept at figuring out new technology, and have been the “tech person” in my family for decades, even before digital technology was mainstream. Add to those credentials that I am a technical communicator, so figuring out how to set a digital wearable device should be par for the course. When I used an iPhone for the first time, I could figure out everything instantly. Apple walks you through set-up directly on the device, and nothing extra has to be done on another device paired up to it. Google Glass had some directions in the viewing screen (for lack of a better term), but it took me a while to set the device up so that it could connect to my phone and read the QR code that the app had to read to connect and activate the account. I had also read the Google Glass online help files on my laptop as I was doing this. It’s not a good sign, to me, if I have to read the website simultaneously while setting the device up. Even then, the directions weren’t that great. It assumed that everything would go smoothly, so set-up would be a snap. However, mine was not, and I couldn’t find any answers to problems I had. Eventually, I did figure out how to get Glass set-up. I was connected to my Google account, and ready to go. It was early in the morning, and I decided to try it out, let me son see how it worked, and my husband was curious to see how it worked, too, even if he was the naysayer against it. Because I didn’t want to accumulate too much personal content on the device, I tried to be careful about not taking video or photos, as I needed to learn how to download apps and manuever the device first. My son liked what he saw, and I had him do the instruction, “OK, Glass, Google Minecraft,” and it did. He liked it. But, being that he is a rambunctious 12 year old boy, I didn’t want him wearing this expensive device for long. It was then my husband’s turn. 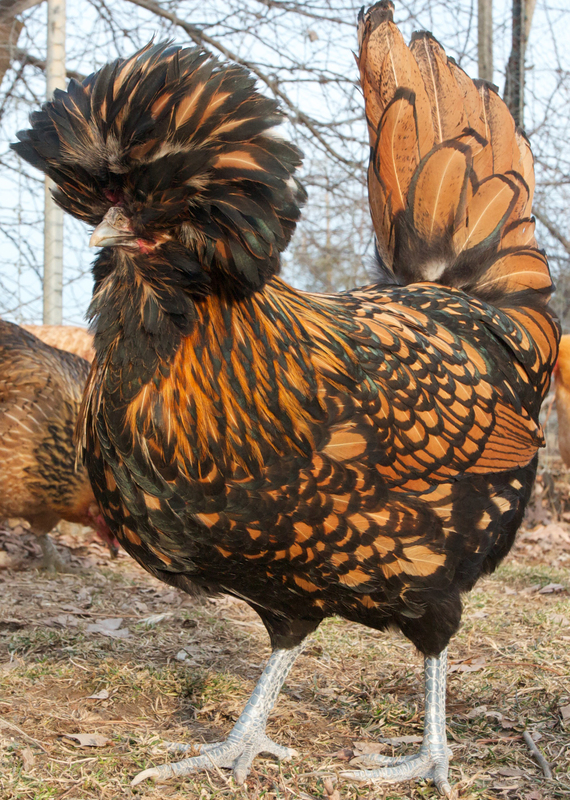 This is a Polish chicken. And this is what my hair looked like that morning (more or less). Before I could try to instruct him on how to manuever the device, my husband decided that he already knew how to use it based on viewing the Saturday Night Live skit from a while back. I scolded him for just trying to do things randomly, and I wanted him to give them back to me if he wasn’t going to give me a chance to explain how to use them properly–based on my limited knowledge at that point. The next thing I know, he proclaims, “OK, Glass, take a picture.” In full glory, in my rumpled NJIT pajamas, angry face, and Polish chicken hair because I had not gotten ready for the day, he had a photo of me. I was not happy about that. He then asked, “If I wanted to send this, what would I do?” At this point in the story, he and I differ on the account, but since it’s my blog, I’m telling it my way. He started to say, “Would you say, ‘OK, Glass, send an email…’?” and when he realized that he’d actually be sending an email, it opened up to THAT PHOTO. “Oops!” he claimed, and tried to back out of it. He did say, “Cancel,” a few times, but nothing happened. But somehow, the photo did get sent, and it was sent to the first person listed on my Google + list, whom I don’t know personally! How embarrassing! I had to get on my laptop later, and send a note to her in Google+ explaining the situation, that I wasn’t sending a photo of a crazy, angry bag lady on purpose, etc. By that time the Glass was confiscated, that was enough to get me on the wrong foot with the device even further. After everyone had left for school and gone off to the office, I had a little time to myself to try to figure more about this. One of the biggest flaws I saw with this device is that it’s not intuitive. As I mentioned, the set-up was not smooth at all. I found that I couldn’t figure out for the life of me how to delete the photo or the Google search from the Glass unless I reset the device back to factory settings. That can’t be right. Additionally, I couldn’t figure out how to get to a screen to add apps. Again, that doesn’t make sense. So, I went back to the Google Glass Help online to try to figure that out. I couldn’t find any instructions on how to add apps. Additionally, I saw that there were less than two dozen apps available at all! Geez, that doesn’t seem like a lot. I know that this is a product that’s still in development, but you’d think that after a year, Google would have more apps than what I saw. So, when I took into account how the product wasn’t intuitive, had very few apps, had no ability to delete things (I was able to delete the photo in my Google account via my laptop, but shouldn’t be), plus the exorbitant price, I succumbed to what my husband had been telling me all along. It wasn’t right for me. So, I called Google to ask for the return labels so I could send it back and get my full refund. Believe me, I was really frustrated with this product. Although my family thought it was cool, they also felt that it wasn’t so easy to figure out how to use it seamlessly, and we’re all fairly technical–even my son. But for something that was the price of two new iPad Air devices or laptops that had much more functionality, I had one funny pair of electronic eyeglasses that didn’t do a whole lot. The experience was disappointing, and I didn’t want to pursue it further–that’s how frustrating it was in one morning. To quote my husband, “If Apple had come out with these instead of Google, it would be cheaper and it would be a completely different experience.” This is coming from a guy who’s very reluctant to use Apple products in the first place, and he even came to this conclusion. The sad thing is, he’s right. When watching that SNL skit again after this experience, my experience wasn’t too different, except the character in the skit got apps on his Glass, at least. The scary thing is, that skit was done a year ago, and nothing has changed since that time! Despite this less than stellar experience with emerging technology, I think if the price came down significantly, the intuitiveness of the product was better–including understanding how to delete content and add apps, and there were more apps to use, then I’d definitely reconsider getting Glass again in the future. The product isn’t ready for primetime, in my opinion. Even the iPhone had more features on it when it first came out in the first year than this has. I initially got interested in Glass after seeing my friend, Marta Rauch of Oracle, using them, and seeing her presentations about the product’s many capabilities. I wouldn’t have rushed to purchase the product and have a chance to use them if I didn’t believe that there was a true potential in the product. I think Marta has more of a chance to play with them and see the potential because she uses them professionally as well as personally. Part of her job is seeing how Glass can be integrated in projects and products that she’s working on at Oracle. I don’t have any such projects or products I’m trying to develop. And as I said, I do think there is potential for a wearable smart device. I don’t think Google Glass in its current state, however, is the product for me right now. Once some of these issues are fixed, I’ll see about giving it another try. Believe me, I’m really disappointed, but at least I can get my money back, and Google is being fairly cool about me returning it. And yes, I’ve given them this feedback–twice. Do you think I didn’t give it a chance? Do you think I was crazy to even try it in the first place? What do you think about such devices? You can put your response in the comments section below. This entry was posted in Uncategorized and tagged Android, Apple, apps, emerging tech, emerging technology, Glass, Google, Google Glass, Google Glass Experience, iPad, iPad app, IPhone, iPhone app, iPhone apps, mobile, new tech, new technology, Polish Chicken, Polish Chicken hair, smartphones, social media, tech comm, TechCommGeekMom, Technical communication, technical communications, video, wearable devices, wearable tech, wearable technology. Bookmark the permalink.